After many months and many car miles, the girls and I have just finished listening to Jim Dale's recitation of the Harry Potter series. I feel, in a word, bereft. What now? Is it all downhill from here? 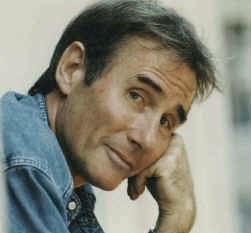 Has Jim Dale RUINED audio books for us? How could one person have done all those voices so convincingly, anyway? With the exception of Luna Lovegood, each and every one of them was spot on, even during those confusing scenes, when everyone is talking at once. I can't help imagining Mr. Dale, at age 6 or 7, as one of those little boys who irritated the heck out of his parents and his teachers because he never shut up. Keep THAT in mind next time you want to put a silencing charm on one of your kids, right? So, now we have to choose a new audio book (although I am tempted to simply listen to the whole Harry Potter series over again). The reader has to be REALLY GOOD and preferably British (because - let's face it - those folks could be reading the phone book and make it sound interesting). The material has to be suitable for a 10-year-old, yet bearable for an adult. We've already done The Chronicles of Narnia umpteen times. The Little House books, for some inexplicable reason, were read by someone who doesn't use proper inflection for her sentences and whose voice therefore grates on my ears, so we've never been able to listen to those. The Little Princess and The Secret Garden - done and done. The Railway Children - done. I tried The Once and Future King (LOVE that book), but the girls condemned it after the first chapter as "boring." Any ideas? And can anyone tell me when I will finally stop calling these things "books on tape"? Well, I think we can rest assured that Larry NEVER reads this blog. 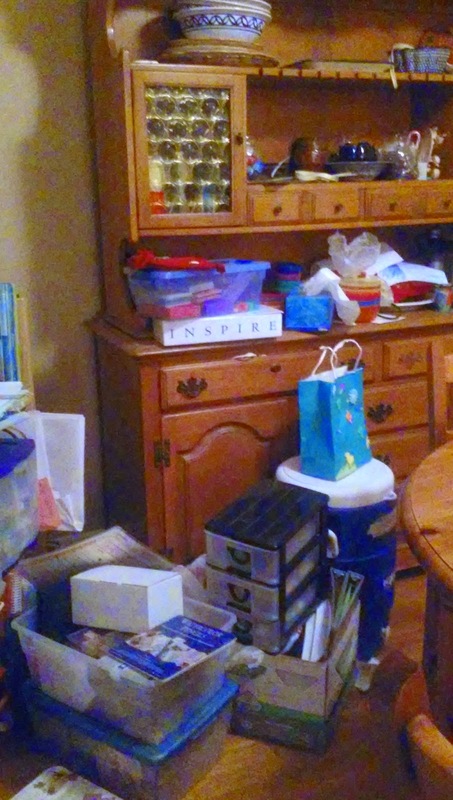 You see, we were crisis cleaning (AGAIN) last weekend because my brother and his girlfriend were coming to visit and all the junk I had moved out of the kitchen was still in the dining room and for some reason there was no longer any place for it in the kitchen and now it is mostly piled up in my bedroom, which is making me weep. Where was I? Oh, yes, Larry. 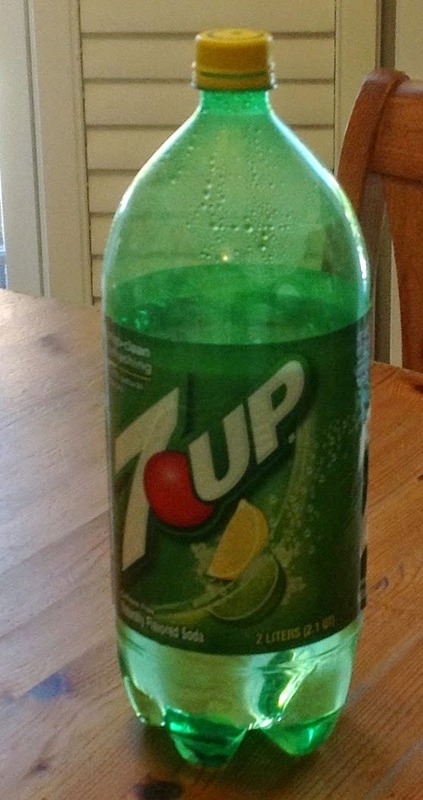 Well, we were trying to clean up when Larry held up my prophylactic half-empty bottle of 7UP and said, "Well, we can get rid of this thing, anyway!" The poor man looked rather startled when I yelled, "NO!" as I grabbed it away from him. Can you believe him? He almost single-handedly inflicted the plague on us. Would it kill him to keep up with what is happening around here? In other news, David managed to get hired at the meth lab. I'm so proud. He had to fill out tax forms and everything, so I guess it is legit, after all. Tomorrow is the homeschool prom, and I just realized that Brian possesses neither a blazer nor a dress shirt that fits. Unlike girls, boys tend not to obsess over prom preparations, so I guess he would have just attended the festivities in his customary jeans and T-shirt if I hadn't noticed in time. I did buy him a Lego bow tie at BrickFair last summer for just this occasion, so he is not altogether unprepared. But now I am stuck trying to shop for a blazer with him at Kohl's tomorrow, even though I don't really know what I am doing (Larry has always taken the boys to shop for formal clothes). It has GOT to be easier than shopping for dresses with a teen girl, however, right? I saw my first stinkbug of the season in my living room last night. 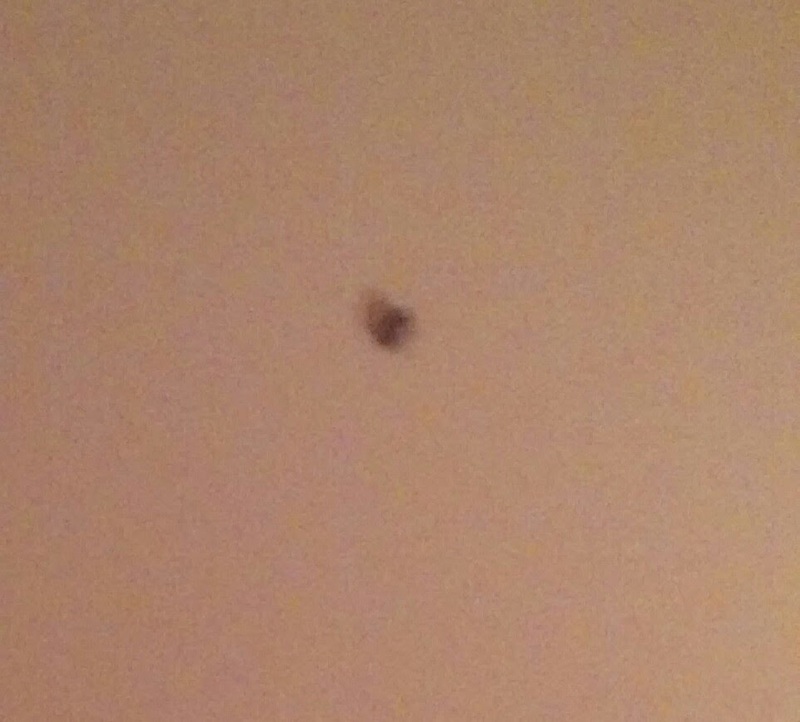 I tried to get a picture of it to share with you all, but - given that I have no desire to go anywhere NEAR a stinkbug ever again and that my phone camera does not have a zoom feature - all I came up with is that fuzzy dot on a freshly painted (Lenox Tan) wall there on the right. It's too bad they've already handed out Pulitzers this year, or I for sure would have gotten one for photography. When I am not busy engaging in prize-winning photo shoots of household pests, I busy myself with this stupid trick of avoiding my email for a day, or even part of a day, so I can live my real life, the one happening out here, away from the computer. You know, the life with children in it, who might actually need me to pay some attention to them? Unfortunately, the longer I avoid the email, the harder it is to open it back up. And the longer I wait to open it back up, the more anxious I get about what might be waiting in there for me. So then I think, This is too stressful. I won't do that again, I'll just read stuff as it comes in. But then I end up getting sucked into whatever problems are happening out there in my neighborhood, or my homeschool group, or whatever, and waste my whole day dealing with other people's problems, while ignoring my own kids; so I think, This is too stressful. I'm only going to check my email once a day. And I am right back where I started. Does anyone else have this problem? Is there a solution? I mean, aside from not using email at all? Or maybe that IS a solution? Discuss. I don't know whether or not I am ever going to let the kids use it, actually, it looks so pretty. 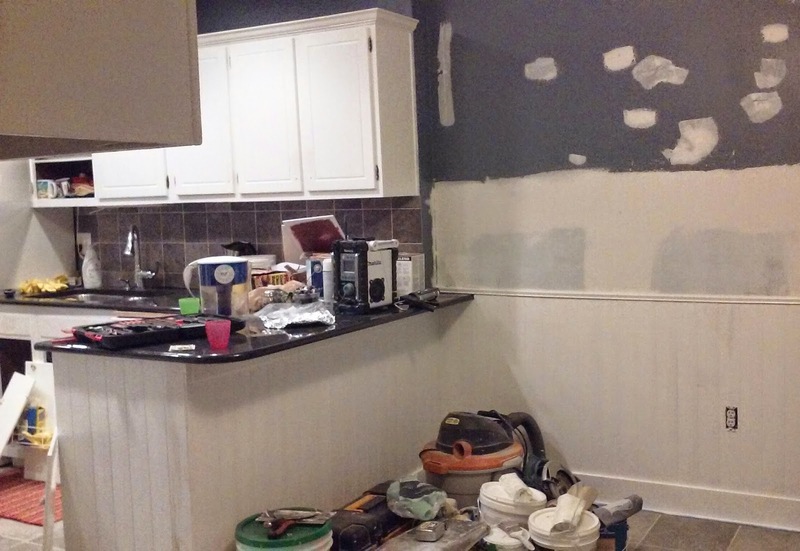 Please note the wainscoting that is dressing up the 46-year-old cabinets. 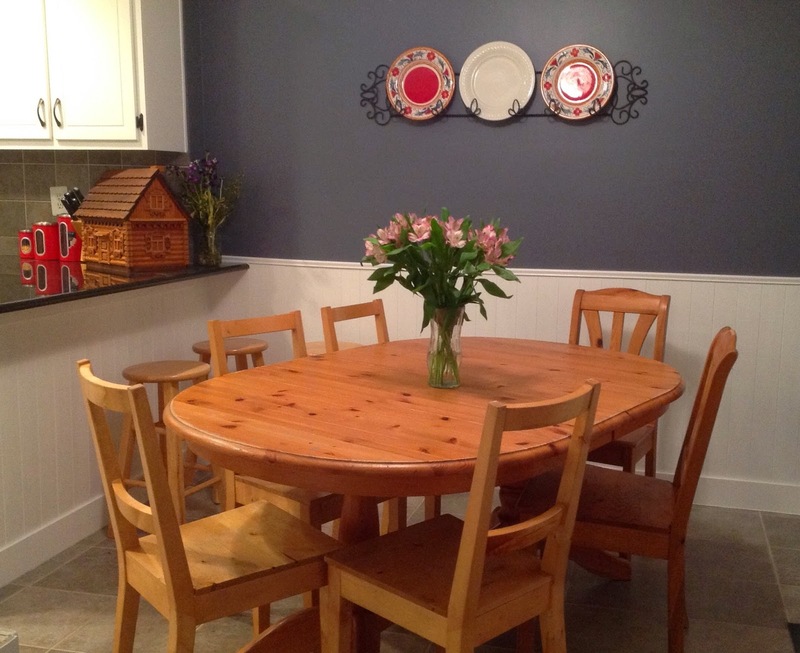 Also, the $4.99 flowers that are sprucing up our 14-year-old IKEA table. Still life with no counter (it's on order). We like our old cabinets so much, in fact, that we installed MORE of them, ones that we had scavenged from neighbors' kitchen remodels over the years. See the new hardware on those cabinets, there to the left? The discussion surrounding its selection made the Iran nuclear talks look like a peaceful chat over cups of tea. I was pulling people in off the street to tell me which of the 3 cabinet handles we had temporarily affixed to the cabinets was the best one. To add to the confusion, Larry went out on Thursday night and bought 2 MORE handles, which he installed on 2 MORE cabinets, just to make the voting more interesting. 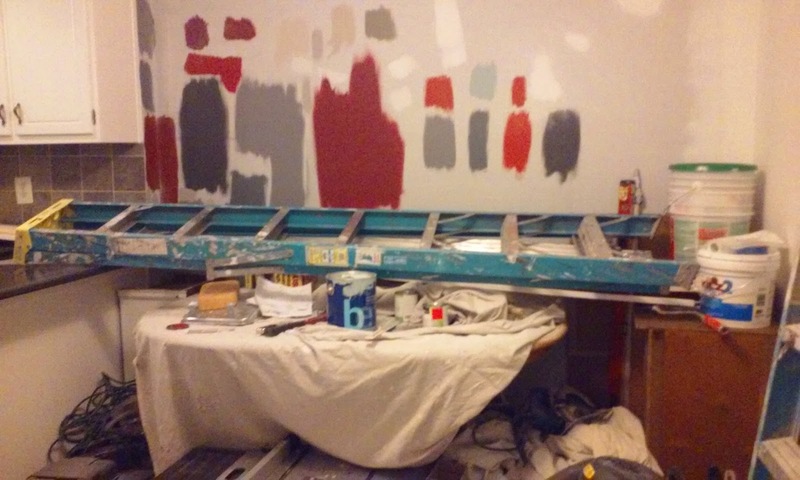 I finally had to make an executive decision that the handyman (who DID pick out the right paint color, after all) and I were right, a decision made easier by the fact that Larry was at work and could not intervene. He accepted defeat gracefully, I'll say that. And, yes, MORE flowers. Bunko is tomorrow night, and we like to have things pretty for our drunken dice-rolling brouhaha, okay? Ah, the pleasures of concealment! Oh, but, hey - what is that picture to the right? Are those...DOORS? 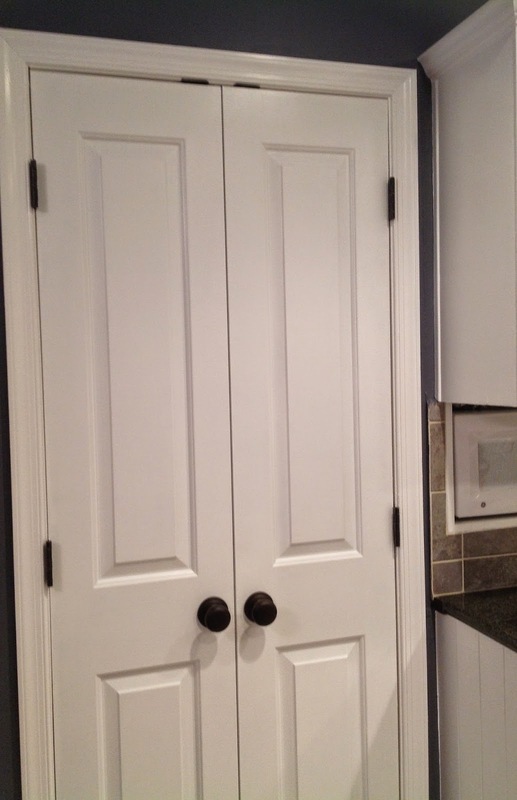 Doors that actually conceal the contents of my pantry, rather than displaying them for all the world to see? Why, yes - yes, they are. I love these doors with all my being. No longer do I have to tidy up the entire pantry when people come over, lining up my vinegars and getting the spices to all face outward on the lazy susan. I have endured 5 YEARS without doors on my pantry, 5 years of public humiliation and a constant sense of disarray. It is a new dawn here in The More, The Messier household, the start of a golden age in which no one will have the flotsam and jetsam of baking supplies staring them in the face every time he/she goes to use the microwave. I'm feeling a little weepy right now, to be honest; but they're good tears, tears of pride and relief that we are putting the doorless years behind us. I just want to thank all the people who have endured alongside us, patiently waiting for Larry and I to get our act together and figure out how to make our house look normal. I apologize to my older children, who spent their formative years not knowing that pantry and closet doors aren't supposed to hang uselessly from their hinges or fall onto unsuspecting people's heads. I can only hope that their upbringing will make my kids more compassionate toward others who are also not up to speed on home improvement, more understanding of other people's non-working light switches and slow-draining tubs. Or maybe it will convince them to make sure they marry people who do not hail from home-improvement-deficient backgrounds, so as not to repeat the cycle for their own kids. People who can maybe do minor home repairs for their aging in-laws, even. One can dream, right? So, yeah, still suffering - and now I have an annoying cough to top it all off, which makes me sound like a TB patient on a bad day. I'm sure Anna of An Inch of Grey will really enjoy hearing me clear my throat of phlegm approximately 15 times a minute throughout her book chat this evening. I'm determined to show up, however, as I still haven't managed to have my copy of Rare Bird autographed. We all need goals - mine are just simpler than most. The handyman is still here, painting our kitchen, finishing up baseboards, watching us argue over cabinet hardware. You know your relationship with your handyman has crossed a line when you're letting him weigh in on the family vote over which door handles look better with the Britannia Blue walls. Come to think of it, he voted for the Britannia Blue, also. At this point, I might just wait until Bunko on Monday night and let all the neighbors vote also. Preferably before we start drinking, of course. Crowdsourcing home decorating decisions is a thing, right? Whine, whine, whine - that's what I have been doing all day. I'm sick with some sore throat/head cold thing my kids brought home (wait, am I allowed to say that when they are homeschooled? ), and I am not dealing with it well. ALL WINTER I did not fall ill, and now - now that the grass is greening and the trees are leafing and the daffydowndillies are nodding their lovely yellow heads - I am stuck inside whining away. My throat hurts. My head hurts. And, worst of all, my tongue and the inside of my lips are COVERED with cold sores. I'm hungry, but it hurts to eat anything but ice cream. 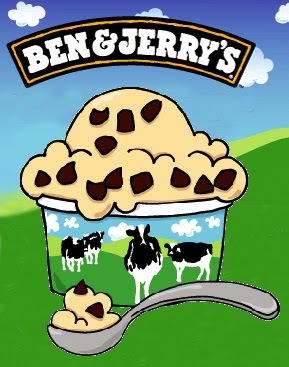 Today was free ice cream day at Ben and Jerry's, and I was too sick to go. And the handyman is here every single morning, which I know is a good thing, because Larry's latest destruction/construction project is nearing an end; but it is hard to have a stranger in the house when I feel like crap. The kitchen pseudo remodel isn't done yet, but I do have to share that we actually managed to settle on a paint color and (BONUS) we actually like it. All of us. 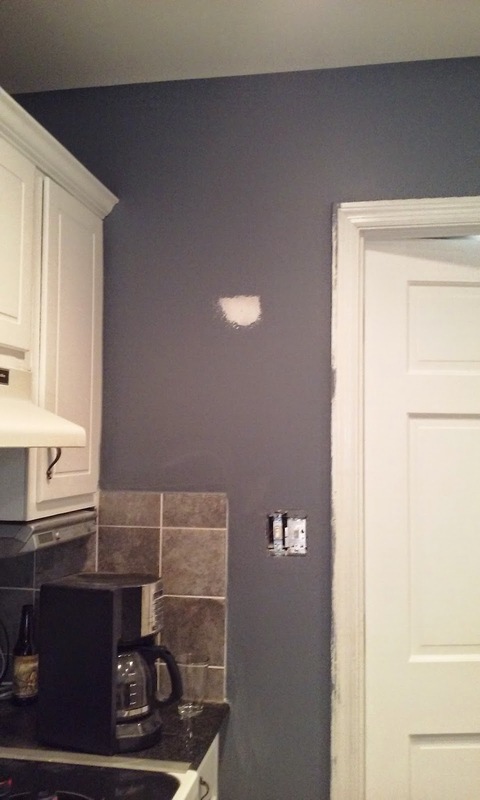 The selectee was Benjamin Moore's Britannia Blue, which is really a dark grey, only it isn't, because we had a dark grey as a runner-up (Englewood Cliffs, if you must know) and it looks nothing like it. So, maybe it is blue, I think, every time I step out of the kitchen. And then I go back in and think that no, it isn't blue (despite the name), because it's too grey for that. 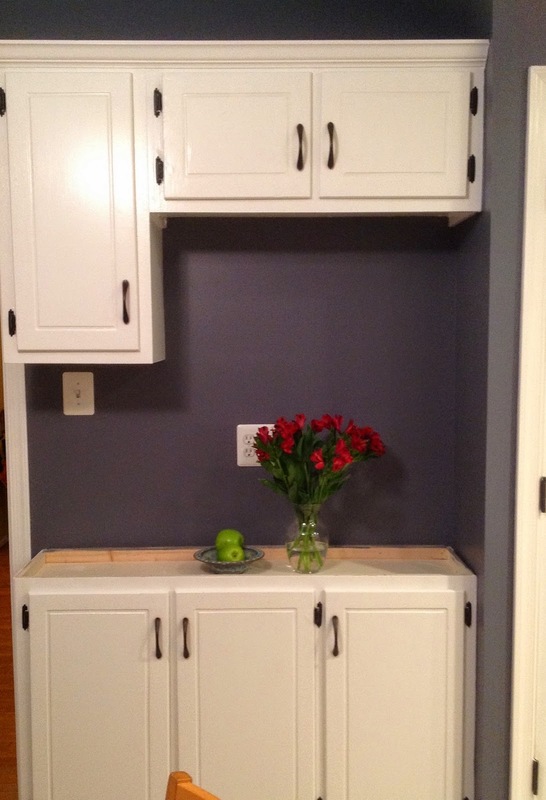 No matter, it's dark enough to make the white cabinets pop and not-grey enough to keep Larry (a US Navy retiree) from chanting "Haze grey and underway!" every time he walks into the kitchen. So now all we have to do is agree on the cabinet hardware and we are all set. I had always dreamed of being one of those families that bond during their extensive travels to fascinating places, but apparently the low-budget version of that is to argue over paint colors and the desirability (or lack thereof) of brushed nickel hardware. So far 3 of us have voted for shiny black. Opinions? David, as a high school senior, is taking his courses at the local community college this year. This is a fine arrangement for me (Yay! I don't have to make him do schoolwork) and also for him (ditto). And, considering that there is a campus shuttle bus that leaves from the train station near our house, I am one happy homeschooling mama with this set-up. So! Last night David told me he needed to be at the station a couple of hours earlier than usual. 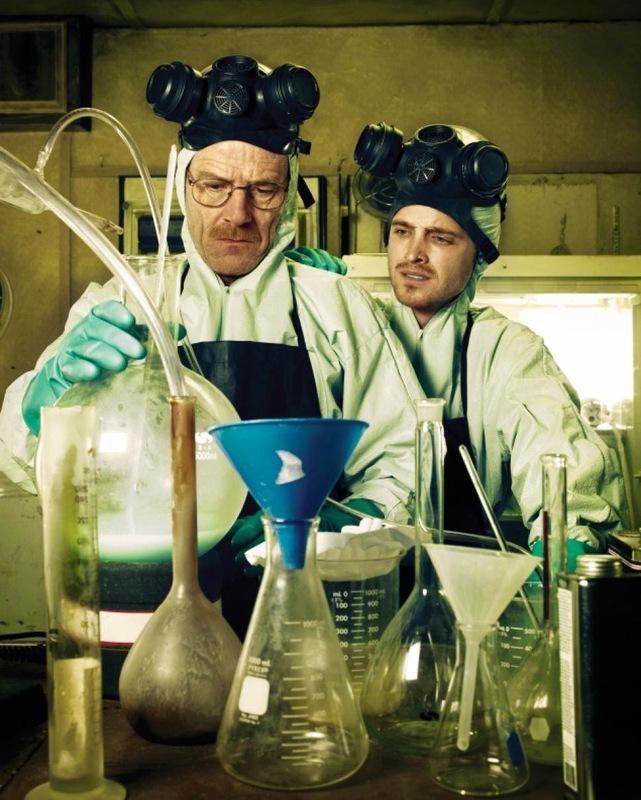 "I'm volunteering for a couple of hours in the meth lab at school," he said. Seeing my puzzled look, David elaborated, "If I do okay, they'll pay me to work there." "Uh, what will you be doing, exactly?" "Helping other students, I think..."
David looked startled. Then, "Oh, no, no - the MATH Lab. Students come for help with MATH." Just finished our taxes, only I didn't really, because there is one more piece of information we have to dig up, and boy did Larry look happy when he heard that. Actually, he hasn't looked happy since his second visit to the paint store today, after which he painted MORE samples on the kitchen wall and I said they were all the wrong ones. Anywhoo, I'd be going to bed to dream sweet dreams of paying the IRS too much money, but instead I have to wait up and hide Easter eggs. I had assumed that everyone here was too old for such shenanigans, but apparently Rachel and Susie still want to get up early on Easter morning and put way too much work into finding a couple of handfuls of jelly beans. The thrill is in the chase, I guess, and so I am staying up to find places to hide the eggs that won't endanger anyone. Because, remember? Most of the kitchen stuff has been relocated to the dining room/living room, in this townhouse formerly known as spacious. Piles of it, on the dining room hutch, in front of the dining room hutch, in the den off the living room...either this is going to be the most impossible egg hunt ever or the easiest (if I go with my idea of just leaving them all behind the couch). You see that blue drink cooler in the picture there? That's not even ours - it belongs to the Boy Scout troop. Mulch Madness is still haunting me. Have I mentioned we have people coming over tomorrow? All this junk is almost freeing, as there is no way I can clean up adequately for our guests. I mean, I'm not even going to try. So there's that. Kitchen/front hallway destruction/construction continues apace. Pantry is built, just waiting for the doors. 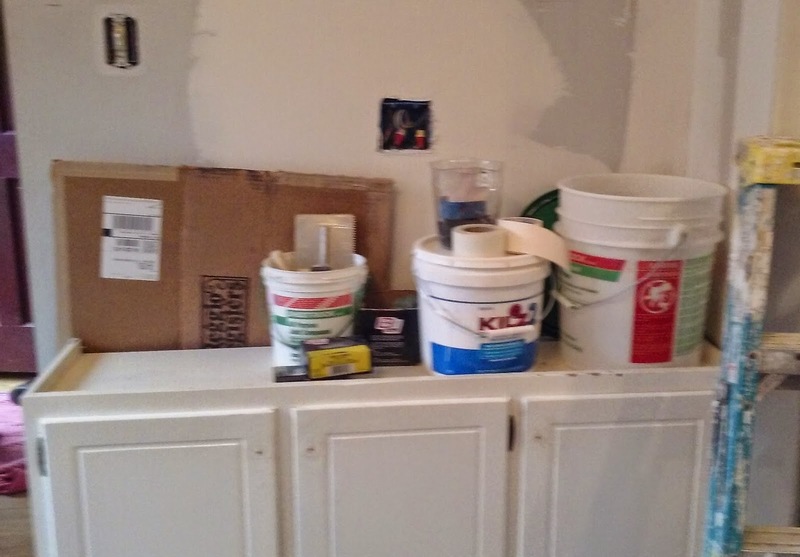 Our neighbors' cast-off cabinets are sitting nearby until they are built into the wall where the hutch used to be. Free cabinets! And they match the ones we already have! Seriously, it's gonna look great. GREAT. We've had those cabinets knocking around our family room in the basement for years, where they would occasionally topple over and fall on unsuspecting children (both ours and guests). I'm glad that we can finally use them and discard the extras and stop worrying about liability issues. I only fell for one April Fool's joke this year - the one about winning a flight in Space X with George Takei. I told David, thinking he'd want to have a chance at it, and he looked at me in a pitying sort of way, obviously wondering how many years were left before he would have to find me a full time caregiver. God, I hate April 1st. I've been informed that today is not only Good Friday, but also the first night of Passover. I am prepared for neither. This info also makes me suspect that this Sunday is Easter. Considering the fact that both girls have outgrown everything they own (it's a skill they have), I am in a pretty pickle. We need to find dress shoes for Sunday Mass, jelly beans for the egg hunt, and if I can scare up a box of matzos somewhere, I'll consider that a bonus.